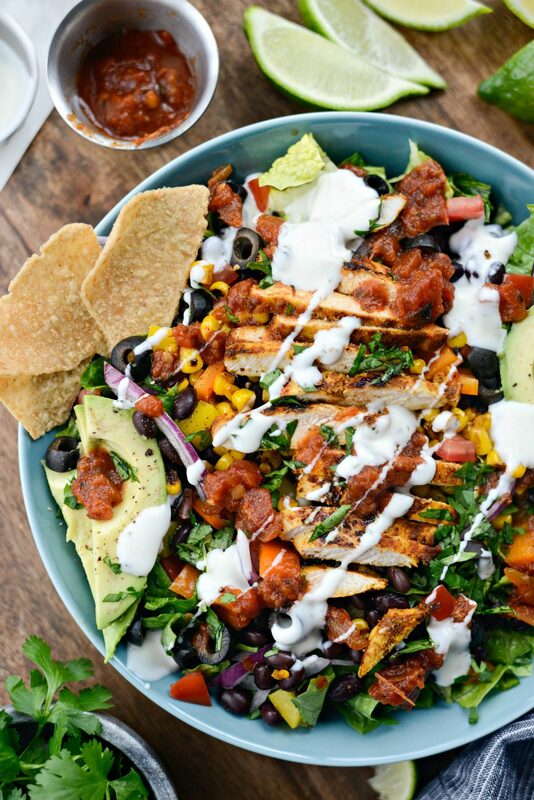 Looking for a healthy and filling salad? 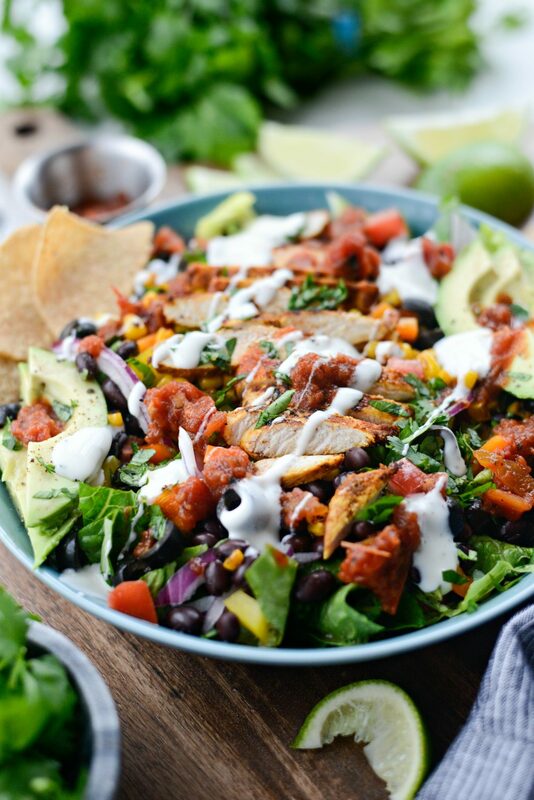 This Southwest Chicken Salsa Ranch Taco Salad is your answer! 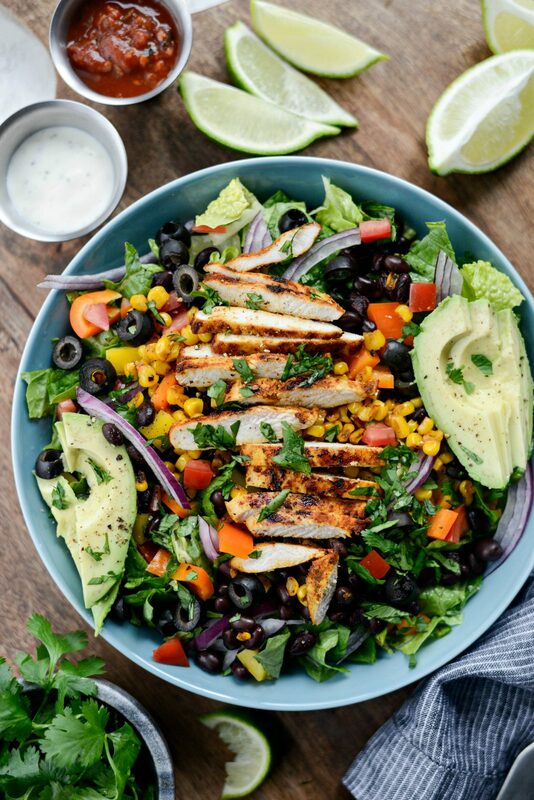 In it, chopped romaine is topped with southwest seasoned chicken, black beans, charred corn, peppers, red onion, tomatoes, olives and avocado. Perfect for meal prep too! Can I just say that I’m so glad to have romaine back in my life?! The recall was a salad eaters nightmare. Of course the romaine warning went out the day after I went grocery shopping. I was in denial and did not want to throw away a brand new package of romaine. I held onto it for a week before finally giving in and pitching it in the trash. In the meantime, I used kale, spinach and arugula to get by. But the moment I saw romaine was back, I made all the salads using all the romaine. I was in deep romaine withdrawal and needed a fix. Something that came without a long stem attached. You feel me, right? I still can’t bring my self to eat another spinach or arugula salad. So over it. Unless it’s a salad from Panera. 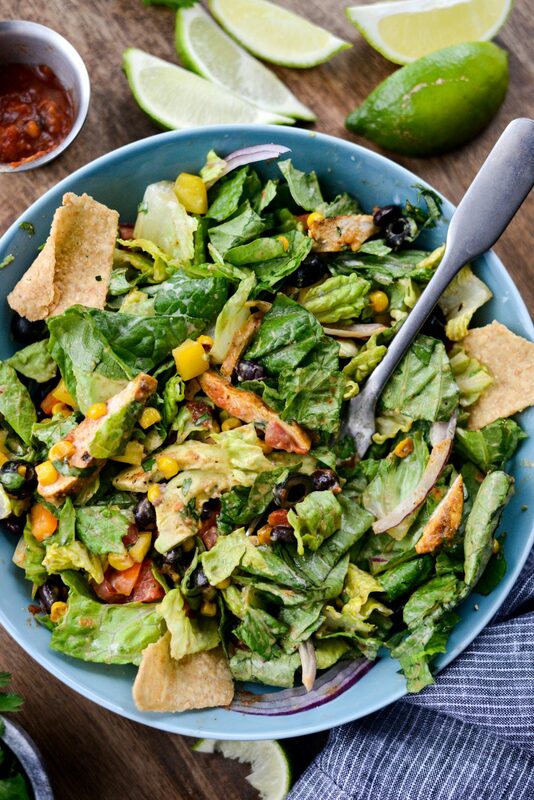 SO this southwest chicken salsa ranch taco salad is the first salad I made with romaine and I. love. it. It’s a big salad with lots of toppings and I could seriously eat it all day every day. It’s also great for meal prep too! 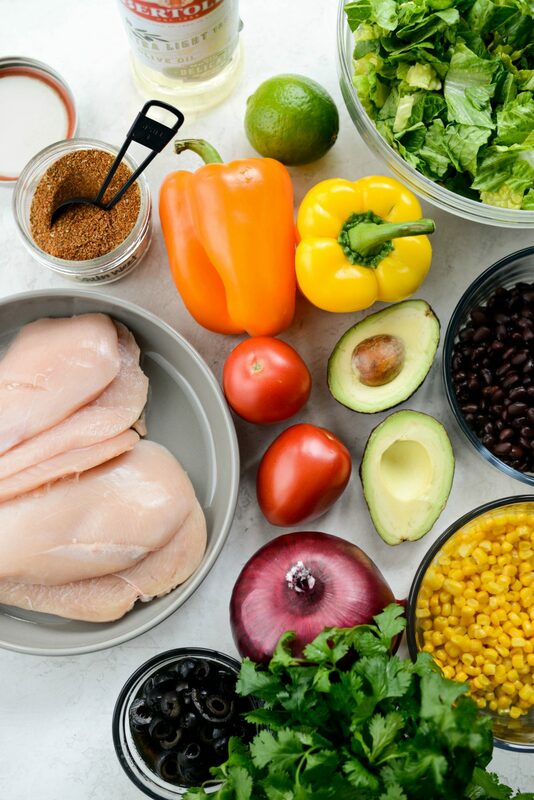 To start, you’ll want to gather up all the colorful produce, boneless, skinless chicken breasts, that southwest seasoning I was talking about and some extra light olive oil. 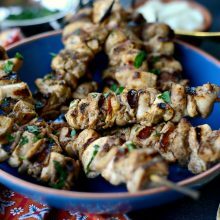 Next, in a shallow dish, use tongs to toss the 1-1/4 pounds of chicken breast halves with the juice from 1 lime, 1 teaspoon olive oil and 2 tablespoons southwest seasoning. Then preheat a large, 12-inch skillet over medium-high heat. 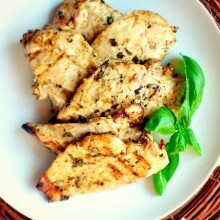 Add 1-1/2 teaspoons of light olive oil and once hot, sear the chicken for 6-8 minutes per side. Adding more oil as needed. Depending on the thickness of your chicken, you may want/need to transfer the chicken to a rimmed baking sheet and finish baking in a preheated 350° oven for about 10 to 12 minutes. Or until fully cooked and no longer pink. 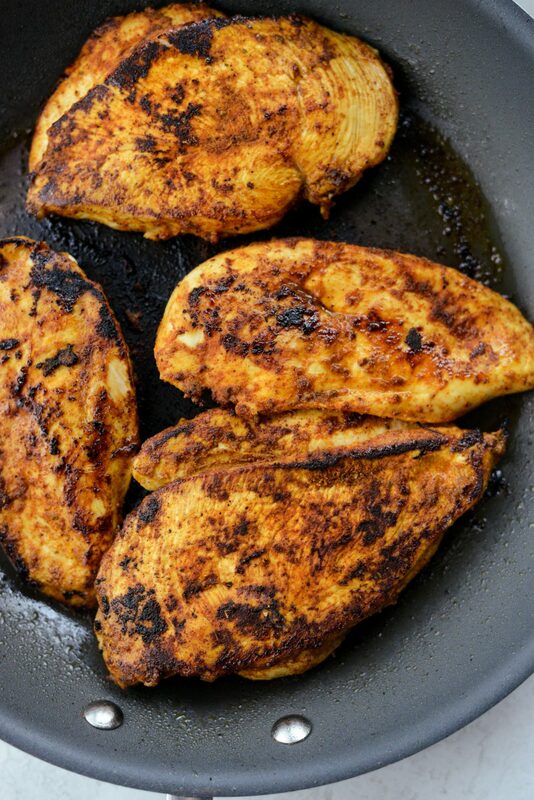 If the chicken breasts are on the thin side, you most likely won’t need to do this. In the summer, you could use your grill. Allow the chicken to rest, under foil before slicing. While the chicken is cooking, prep all of the veggies for this salad. To the same skillet that the chicken was once in (and without wiping it out) add the corn. 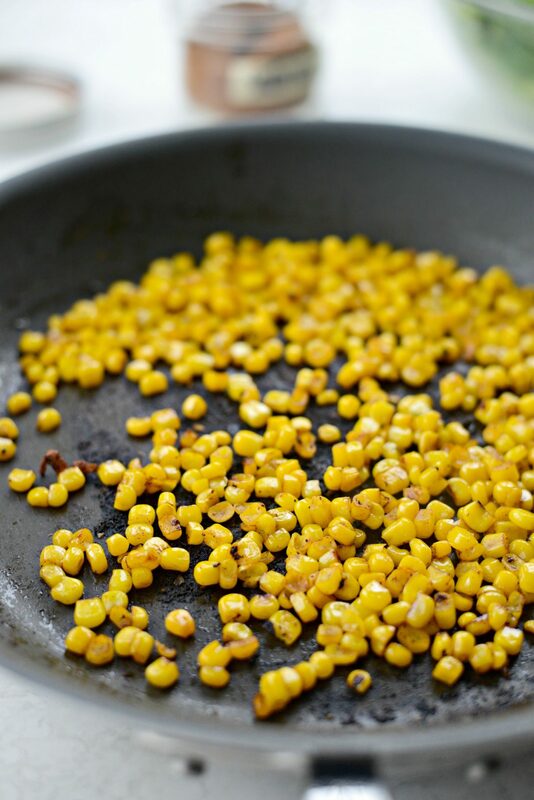 Spread the kernels out in an even layer, and cook 3 to 4 minutes or until the corn is charred in spots, stirring occasionally. Then transfer to a bowl. Finally, place the chopped lettuce into shallow bowls. Then top with the black beans, corn, peppers, tomatoes, onions, olives and sliced chicken. Add sliced avocado, a squeeze of fresh lime juice and a sprinkle of chopped fresh cilantro. I also add a pinch of kosher salt and freshly ground black pepper to pretty much all my salads. One thing I have learned since starting this healthy diet plan, was shortcuts to salad dressings. For example; in any taco, Tex-Mex or southwest type salad, I like adding salsa (preferably one without added sugar). Meaning, that you will need less dressing than what you may typically use. 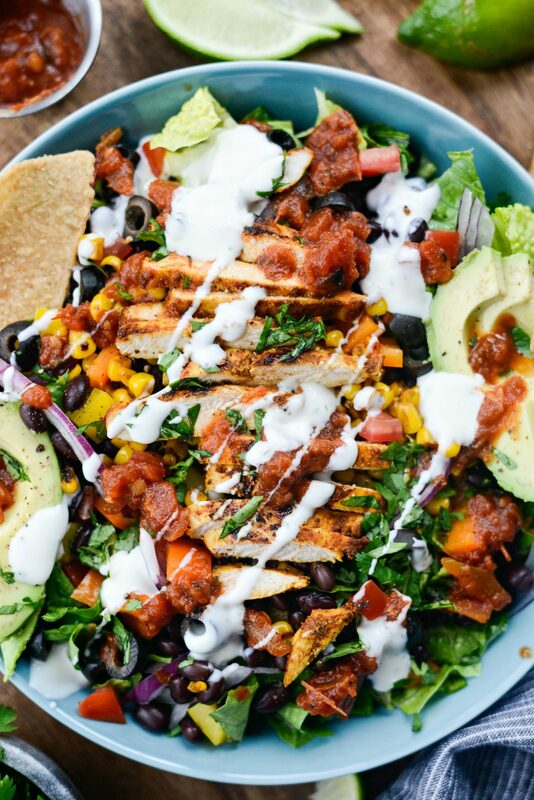 So for example, in this southwest chicken salad I only use 1 tablespoon of yogurt ranch (which I plan to share the next time I run out and need to make it. Promise!) and 2 tablespoons of salsa. Instead of free-pouring ranch and most likely over dressing. Then once you toss the dressing in with the salad, some of the southwest seasoning that’s on the chicken will come off, flavoring the entire salad. And the southwest flavor blended with the ranch dressing and salsa is perfection. 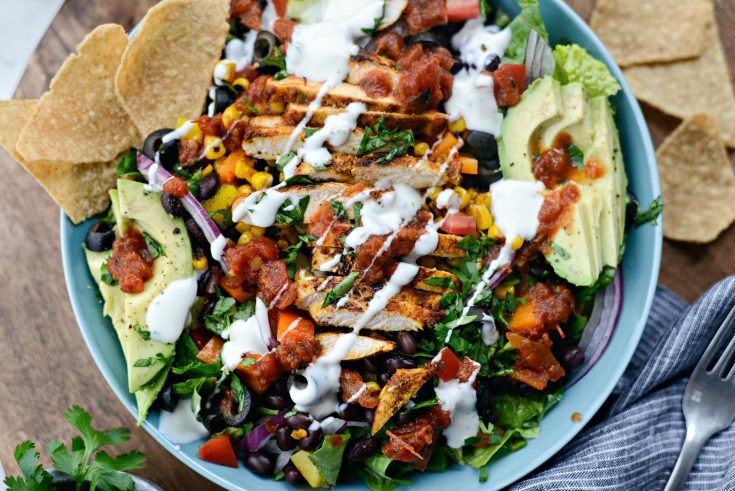 Add a few baked tortilla chips (or chips of your choice – I love sweet potato tortilla chips!) 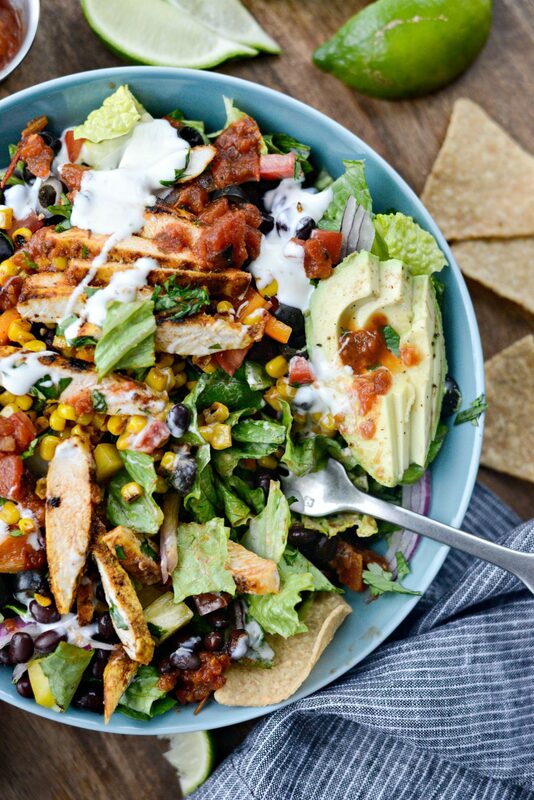 and you’ve got yourself one heck of a delicious taco salad. Enjoy! 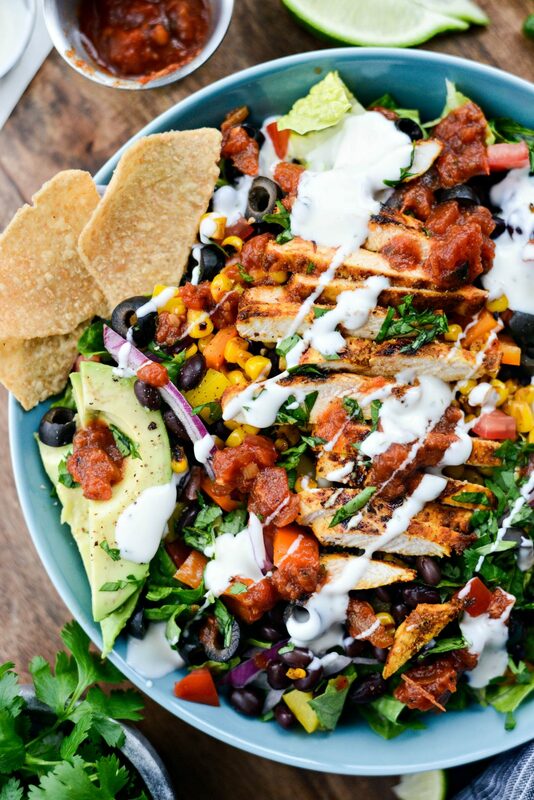 And if you give this Southwest Chicken Salsa Ranch Taco Salad recipe a try, let me know! Snap a photo and tag me on twitter or instagram! In a bowl, toss the chicken with lime juice, olive oil and southwest seasoning. Heat 1-1/2 teaspoons in a 12-inch skillet over medium-high heat. Once hot, sear the chicken for 6 to 8 minutes on both sides. 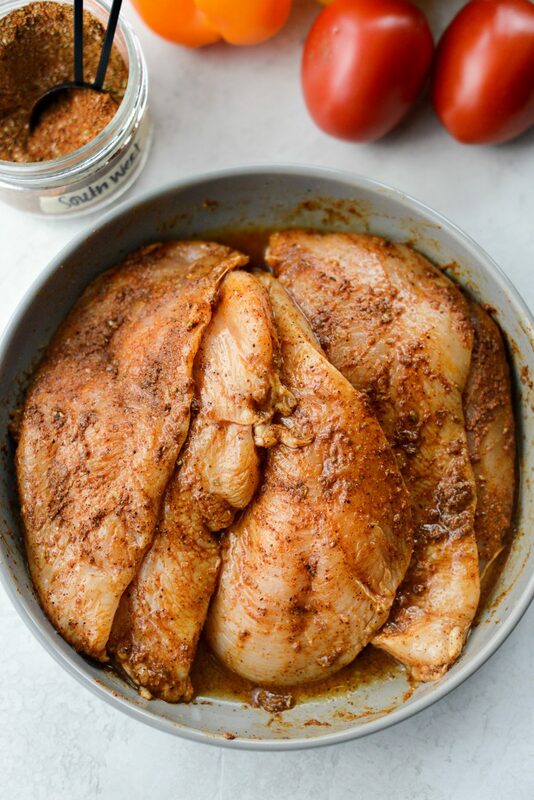 Depending on the thickness of your chicken breasts you may want/need to place them onto a rimmed baking sheet and finishing baking at 350° for about 10 to 12 minutes or until fully cooked and no longer pink. Transfer to a cutting board and allow the chicken to rest before slicing. To the same skillet that the chicken was in (do not wipe it out) add the corn and cook 3 to 4 minutes or until the corn gets charred in spots. Place the chopped romaine into shallow dishes and top with black beans, corn, peppers, tomatoes, onions, olives (if using). 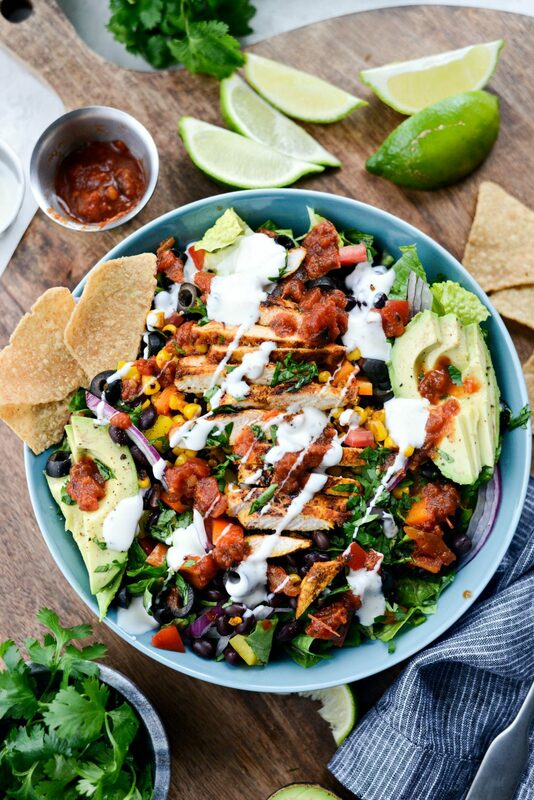 Top with sliced cooked chicken, cilantro and drizzle with 2 tablespoons salsa, 1 tablespoon ranch dressing* and squeeze a wedge of lime over top. 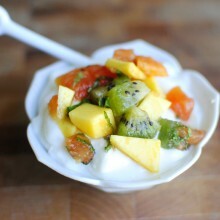 *I made a yogurt ranch, and I promise to blog and share that recipe the next time I make it!